So many ways to sum up a year. January: I know I said we were going to have a quiet night and probably not even see the New Year in, but plans do have a habit of changing. February: It’s the first of February, so that means TWO MONTHS UNTIL AMERICA!!! March: We’re back in Christchurch, and feeling much refreshed and ready to face whatever this city throws at us. May: We’ve just come back from Riccarton, where we almost but not quite bought a new vacuum cleaner (our trusty old Dyson has so many parts needing replacing that it’s been looking more and more economical to just get a new one – and we realised it must be about 11 or 12 years old now, so it’s actually lasted quite well). June: Another big aftershock this morning. July: In the last couple of weeks I’ve actually ventured in to town a couple of times. August: Too late to back out now, I’ve booked my flights. September: One year ago today, the people of Christchurch thought we’d had a disaster, but we had no idea how much worse it was going to get as the year progressed. October: After a couple of incredibly busy weeks trying to catch up with work and study after my unplanned break, I had my final exam on Friday, which means I have finished my BA!!! November: Yay! I managed to release 11 books at 11 am on 11/11/11. December: Yesterday’s mail: I got a corporate Christmas card, MrPloppy got a bank statement, and George got a parcel from Lytteltonwitch. The dragon has a head! My plan for a lazy holiday is working well. In one sense I’m achieving very little with my days off (I’m not even getting as much reading done as I’d expected), but in another, I’m achieving exactly what I planned – totally relaxing and letting the stress of the year drift away. I reckon by the time I go back to work next week I’ll be ready to face whatever 2012 throws at me (remind me I said that in February when life starts getting chaotic and overwhelming again, won’t you). I’m pretty pleased with how it turned out. Between the inner and outer fabric layers it’s got a layer of snowfoam to protect against knocks and scratches, and a layer of plastic to give it a bit of water protection (it’s not completely waterproof, of course, but at least I won’t need to worry if my bag gets rained on). So now I can happily cart my magic book device around with me everywhere I go. The other big excitement of the week was a trip into Riccarton to spend lots of money. Well, some money, anyway. We had a few vouchers and Christmas money to spend, plus I got a nice wee bit of back-pay, so we had a splurge on a few DVDs (Harry Potter 7.2, the latest Pirates of the Caribbean, and a box set of Supernatural, which MrPloppy started watching on TV from about series 6, so wanted to see the earlier series), and a new shiny food processor – I’d been wanting to replace our old one for ages (I bought it with my first paypacket from my teaching job, so it’s about 20 years old and definitely showing its age), and the post-Christmas sales meant I could pick up a decent one for under $300. I’ve been playing with the new DD site, which has been interesting. Definitely needs a lot more work, but I can see how it could be an improvement over the current one. Well, just as long as it lets me change the colour scheme – the current DD theme is possibly the ugliest I’ve ever seen! Real book: Machine of Death edited by Ryan North, Matthew Bennardo and David Malki! I spent Christmas in the best possible way – sitting in the shade of a tree reading, and eating raspberries (you Northern Hemisphere-types might get all the pretty of a white Christmas, but it’s tough to compete with fresh raspberries!). We decided as we’d both spent last Christmas away from home in different directions, with different sides of the family, this year would be just for us – a nice quiet time at home with no visitors, no stress, no fuss (we didn’t even make a proper dinner in the end – just snacked all day). And it was wonderful! Part of the wonderfulness is that I got a new toy! Along with a couple of normal paper-type books, MrPloppy gave me a Kindle! I’d been looking at them for months, but wasn’t sure whether I’d like using one, and couldn’t decide whether to get a Kindle (tied to Amazon) or a Kobo (tied to Whitcoulls), and had pretty much decided I could live without one (but still looked wistfully at them from time to time. So MrPloppy decided to just go ahead and get me one anyway It’s just the most basic model, with none of the bells and whistles of the latest versions, but I’ve fallen in love with it already. I’ve downloaded a few books to it from Amazon (and found they even have some for free! ), which was incredibly fast and easy (almost dangerously so – I can see it’ll be a temptation to just keep buying books! ), and have finished one already. The e-paper screen is incredible – it really is like reading proper print, with none of the eye-strain of reading on a normal screen. And the Kindle itself (now renamed “my magic book device” (my mp3 player already had the title of “my magic story-telling device”)) weighs about the same as a smallish paperback, so it’s not uncomfortable to hold. I don’t think it will ever completely replace physical books for me (I can’t bookcross e-books, for a start! ), but I can see it getting a lot of use. And it’s going to be fantastic for my trip next year – instead of trying to cram enough books in my handluggage for the 30-odd hour flight, I’ll be able to carry as many as I like on my Kindle. Now I just have to make it a nice cover to keep it safe when it’s in my bag. So, not only a new source of reading material, it’s an excuse for craftiness as well! Anyway, hope you all had (or are having – I think it’s still Christmas in a few places yet) a lovely Christmas, and for those in countries civilised enough to have the day off work for Boxing Day, I hope it’s a restful one. Ok, this is just getting tedious now. Two more big earthquakes today, a 5.8 and a 6.0, both followed by many many many smaller aftershocks. We’re ok over this side of town (we had a few small things fall over, and all the water sloshed out of George’s water bowl, but nothing broken this time) but there’s been a bit more damage (and lots more liquifaction) out east. Sounds like only a few injuries though, which is good news at least. The worst bit (from my selfish point of view) is that we were having our traditional Bookcrossing Christmas party (which I’d expanded to include a few non-bookcrossing friends) tonight, but naturally no-one’s feeling much like going out tonight, so most people have called to cancel Oh well, lucky I hadn’t started cooking anything yet! It’s just as fiddly as I remembered it, but I’m slowly making progress. My other creative project for the weekend was baking a big batch of pfeffernussen (German Christmas biscuits – though spellcheck insists that what I really meant was “effervescence”) and making up little parcels for all those inevitable “X gave me a present and I haven’t got anything for them” moments at work next week. Haven’t been doing much releasing lately, so only one catch to report, but it is a second-generation one: The Private Life of Mona Lisa by Pierre la Mure. And the anonymous finder who caught Arrow of God has re-released it into the wild, so at least they get the Bookcrossing concept, even if they haven’t joined. This one dates back even further than the advent calendar – in fact, the pattern comes out of the same book I used for my brother’s wedding sampler, and I’ve got a feeling I may have started this one first. It’s going to be gorgeous once it’s finished, but after only adding a few stitches to the border I’m beginning to remember why I keep putting it aside – the wonderful shading and sparkly effect (which is precisely why it’s going to look so good) is achieved by using lots and lots and lots (and lots) of different colours (which means changing threads every few stitches), and liberal use of blending filament (a thin sparkly thread you combine with normal embroidery cotton to give it shine – it looks great, but it’s horrible slippery stuff to work with, constantly either tangling or slipping out of the needle). No wonder I got frustrated and gave up! I went to see When a City Falls a few days ago. It’s a feature-length documentary about the Christchurch earthquakes, made by a Christchurch film-maker. A totally amazing film, very raw and emotional, and really captures what it’s been like for the ordinary people living through a horrific year. I don’t know if it’s being released more widely than NZ, but if you get the chance to see it, do. But take lots of tissues. You should never watch a film about earthquakes in a multiplex when there’s an action film in the next theatre – the low rumbling of the loud bits coming through the wall sounded so much like an approaching earthquake! I went into the Square on Sunday. That might not seem like a huge achievement, but to the people of Christchurch, it’s enormous. Cathedral Square (or just “the Square” to most Cantabrians) is the centre, and very much the heart, of Christchurch. It’s the site of our iconic cathedral, it’s where tourists and locals congregate to listen to bands or buskers, argue with the Wizard, browse the crafts markets, buy lunch from a food cart, or just sit in the sun and watch the bustle of the city. Or at least it was – for the last nearly 10 months it’s been silent, deep in the cordoned-off red zone, out of bounds to all but demolition workers. 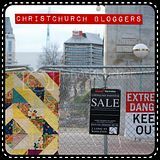 But CERA, in a rare burst of compassion, decided to take advantage of a lull in demolitions in the surrounding area and opened up a public walkway through to the Square for a few weekends, to let Cantabrians see the damage for ourselves and have a chance to grieve what we’ve lost. So on Sunday I decided to go and see the Square. I’d of course seen it a millions times in photos and video, and from a distance from the edge of the cordon, but sometimes you just need to see something in person to really get your head round it. The walkway runs from the container mall in Cashel Street along Colombo Street to the Square. There’s only a smallish section of the Square accessible, with barriers keeping you away from the buildings (though there’s still a sign at the entrance warning you that you’re entering at your own risk and if there’s a major aftershock you could die, and someone counting everyone in and out so they know how many bodies to retrieve from under the rubble), but there’s still enough space for everyone (they only let 300 people in at a time) to have their first real look at the Square, and the Cathedral. I didn’t expect to be particularly affected – after all, I’ve seen all the pictures, and I wasn’t actually in town on the day, so I don’t have traumatic memories. But my first view of the Cathedral was surprisingly heart-wrenching. It’s so broken, and looks so wrong. Weirdly, what was most poignant for me was seeing pigeons flying in and out of the gap where the rose window was – it made it seem so neglected. Everyone was pretty somber, and a few visibly upset. I ended up talking to a woman who was standing next to me, sharing memories of all the things we’d seen and done there. She’d moved away from Christchurch 20 years ago, but she was still on the verge of tears seeing what her home town had become. As well as the shock of seeing the buildings that have already been demolished (the aquarium is gone, the duty free place on the corner is gone, the Press building is gone, that old picture theatre they turned into an internet cafe is gone…. ), there’s evidence everywhere that nobody’s been there for months. It’s kind of like in post-apocalyptic films where they show how nature has taken over from the humans – there’s weeds growing through the paving, the lawn around the cathedral has turned into a meadow, and of course those pigeons roosting in the cathedral’s beams to complete the picture. Walking down Colombo Street was the same, with those weird touches of a life abandoned – in McDonalds there was someone’s lunch still sitting on the table in the window, and a bicycle left behind in a bike stand. That’s the partially-demolished Grand Chancellor in the background – the lean’s not quite so obvious now that its roof is gone. Ok, so it took me a lot of years, but I finally finished the advent calendar! So now I’m not sure what to do with it. Maybe I’ll give it to Mum anyway, and she can share it with the kids in a suitably supervised way. How come the cat gets better mail than we do? Oh, and one last bit of news (which isn’t really news, because I already knew I’d passed, though not how well): results were released last night, and I got an A+ for my phonetics course. A very nice way to finish my degree!